The Bloody Mary is a classic cocktail in South Carolina, and apparently one of the most versatile. Some call it a drink, others call it brunch. Whatever it is, this concoction has become a focal point for foodies and mixologists looking to get creative. No matter how you like them, you know that not all Bloody Marys are created equal—here’s where you’ll find the best ones in South Carolina. This buzzy joint is located directly on the historic waterfront in Georgetown. You can enjoy the views While sipping and munching on this exquisite Bloody Mary. Cilantro infused vodka harmonizes with garlic, horseradish, and Zing Zang, and features plenty of yummy garnishes that make this drink an edible treat, too. Brunch at Blind Tiger is famous, and their Bloody Marys have a lot to do with it. In fact, people have been known to come here simply to get a taste of this epic cocktail. Fans agree they offer just the right amount of heat, spice, and flavor to create nothing but perfection. Fans flock to this place on the weekends for the build it yourself Bloody Mary bar. You are master of your own creation, and can experiment to get the perfect flavor that will delight your taste buds. They offer multiple choices of vodka, tomato juices, and garnishes, so the Bloody Mary you create can truly be one of a kind. Lots of places are starting to put bacon in their Bloody Marys, but Cafe Strudel takes it to a whole new level by using bacon infused vodka in their special concoctions. Fans agree it's the best cocktail on an already star-studded drink menu. This cocktail is most popular with the brunch, but you can get it whenever you like. Not only does blueberries Grill have the best Bloody Mary of the Grand Strand, they have four different varieties to choose from. Choose from classic, dill, citrus, or spicy to give your taste buds a treat they won't forget. Each Bloody Mary's made with their very own house blend of Bloody Mary mix, and you won't find anything quite like it anywhere else. This place is oozing southern charm, and their Bloody Marys are a big part of it. Their delicious Bloody Mary's come with a plate of pickled veggies for added flavor. It doesn't get any more classic than this. A sushi place might not be your first pick for a Bloody Mary, but you'll want to make an exception for Sole on the Green. They make their own Bloody Mary mix, so you really can't find one like this anywhere else. For an extra kick, try their honey habanero Bloody Mary, made with moonshine for a beautiful blend of sweetness and spiciness. This cozy little breakfast nook features of sake Bloody Mary that's worth your time and money. They make their own Bloody Mary mix in house to give you the freshest flavors possible. In fact, their entire menu is chock-full of originals that are sure to become your go-to favorites. This two-location Myrtle Beach favorite offers a do-it-yourself Bloody Mary bar that you won't be able to resist. Add-on items include things like olives, blue cheese, various spices, okra, green beans, and bacon for a filling refreshment. The food here is also something to rave about so you get the best of the food and drink world's all in a single experience. Their Bloody Mary’s are simple and straightforward, which is why they’re so darn popular. 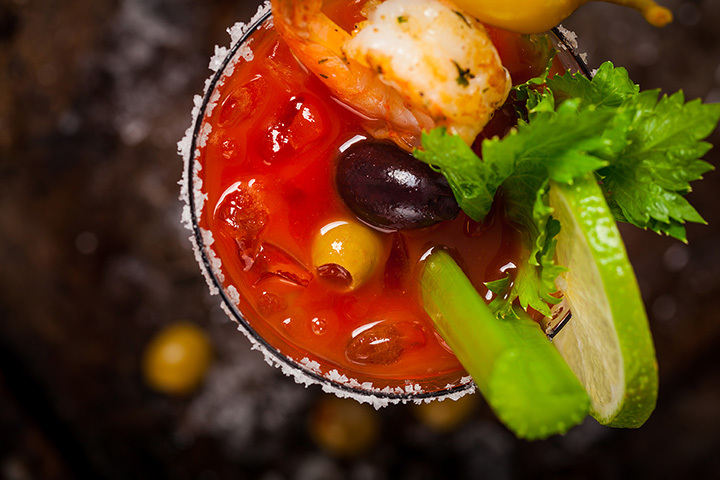 Garnished with citrus fruit and mixed to perfection, their Bloody Marys are refreshing and flavorful. It's one of the best places in town to grab a cold drink and relax while you watch your favorite sports team.